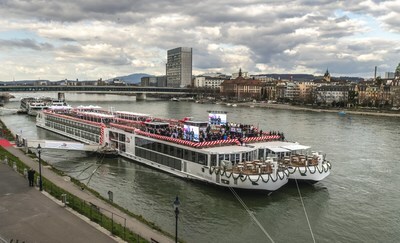 LOS ANGELES, March 19, 2019 /PRNewswire/ -- Viking (www.vikingcruises.com) today welcomed the latest additions to its river fleet, with the naming of seven new river ships during a celebration on the Rhine River in Basel, Switzerland. Of the seven ships, six are Viking Longships ? Viking Einar, Viking Sigrun, Viking Sigyn, Viking Tir, Viking Ullur and Viking Vali ? which will be deployed on Viking's most popular itineraries on the Rhine, Main and Danube Rivers. The seventh new ship ? Viking Helgrim ? was inspired by the Longships design and built specifically for the Douro River, bringing the company's total number of sister ships in Portugal to four. This launch of new river ships is Viking's latest milestone as the company continues to expand and dominate industry awards. Just two weeks ago, Viking swept Cruise Critic's 2019 Cruisers' Choice Awards with 11 First Place Wins ? including the new "Best for River Cruises" category ? and just last month the company took delivery of its sixth ocean ship, Viking Jupiter, which will be named in Oslo on June 6. In addition, Viking was again named the #1 River Cruise Line by Condé Nast Traveler in the publication's 2018 Readers' Choice Awards, and Travel + Leisure readers named Viking a #1 Ocean Cruise Line and one of the World's Best River Cruise Lines in the 2018 World's Best Awards. "We began hosting guests on the rivers of Russia 22 years ago, and we have always done things differently. We focus on the destination, and we provide travel experiences that allow our guests to learn, to enrich their lives and to explore the world in comfort. 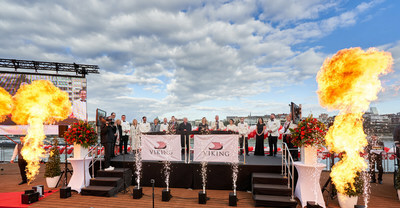 It is 'The Viking Difference' that has made us the leading river cruise line in the world ? and has helped river cruising become one of the fastest-growing segments of travel," said Torstein Hagen, Chairman of Viking. "As the leader, it is also important that we recognize those who have helped us achieve success. This year I am especially proud to honor members of the Viking family as godmothers of our newest river ships." The naming event was executed by connecting the new ships via satellite across four European cities. 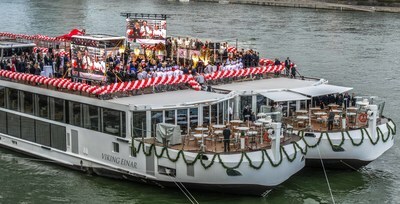 Viking Einar and Viking Sigrun were docked in Basel and named by in-person by their godmothers. The other five ships were "virtually" named by their godmothers: Viking Sigyn and Viking Ullur in Rostock, Germany; Viking Tir and Viking Vali in Brunsbüttel, Germany; and Viking Helgrim in Porto, Portugal. In keeping with another maritime tradition, a bottle of Gammel Opland aquavit was broken on the bow of each new ship. Gammel Opland hails from the same county in Norway where Chairman Hagen's mother, Ragnhild ? also lovingly known as "Mamsen" ? was born and was her favorite brand of aquavit. 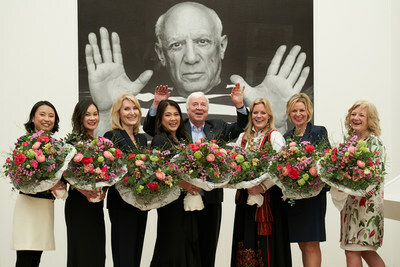 Following the naming event, guests enjoyed dinner at Basel's Fondation Beyeler museum, set amidst the museum's newest and most ambitious exhibition: The Young Picasso. Blue and Rose Periods. Guests were also treated to a performance by Alma Deutscher, the 14-year-old English composer, pianist, violinist, and child prodigy ? who is a favorite of Chairman Hagen's. Designed for discerning travelers with interests in history, art, music and cuisine, Chairman Torstein Hagen often says Viking offers guests "the thinking person's cruise" as an alternative to mainstream cruises. Ships are small to get guests closer to their destination, with more time in port and more overnights. On board, guests find serene Scandinavian spaces, where every room is both beautiful and functional, quiet and filled with light. With the most al fresco dining opportunities whether on the rivers or at sea, featuring regional cuisine and always-available American classics, Viking's guests can truly dine in their destination. A focus on cultural enrichment brings immersive experiences on shore and on board. And only The Viking Way® of exploration provides guests with itineraries that feature Local Life, Working World and Privileged Access experiences. Local Life excursions shine a light on everyday activities and include experiences such as Viking Chef-hosted trips to local farmers markets, tea at home with local residents and visits with local schoolchildren. Working World excursions feature behind-the-scenes "making of" experiences, illuminating destinations through their most famous exports, such as factory and farm visits. Privileged Access excursions include experiences like The Oxford & Highclere Castle program, Viking's highest-rated Pre/Post Extension that visits "The Real Downton Abbey;" a private tour of Göttweig Abbey, where Viking guests have a rare opportunity to dine with the Abbey's monks at Stift Göttweig and receive a special Traveler's blessing; and an exclusive dinner in the Churchill War Rooms in London as part Viking's new Churchill's London Pre/Post Extension. In addition, Viking offers a compelling value compared to other cruise lines. Every cruise fare includes an outside stateroom, a complimentary shore excursion in each port of call, all onboard meals, and all port charges and government taxes. Guests also enjoy many complimentary amenities as part of their fare, including: beer and wine with lunch and dinner service; Wi-Fi; and cultural performances as part of the Viking's Cultural Curriculum® onboard programming.